And so Lord Jesus Christ reaffirmed the Biblical commandment “Thou shalt not kill.” You see, these so-called followers of Jesus Christ were killers from the very beginning. And despite the order of Christ, still they are continuing their killing to this day. But vina pashughnat: whatever seemingly pious things they may do, those who are animal killers, meat-eaters, can never understand God. It is simply not possible. Srila Prabhupada: Yes. Upon arriving in America, I gave lectures in churches. And what is a church? A church is a place where there are God-conscious persons. So I never criticized a church or mosque. Never. Because whatever the group may be, the main thing is, they are God- conscious—and so they are good. But when they disobey the Lord’s commandments, then I must criticize. Still, I criticize only these rascals—those who set the pattern, those who disobey the commandments out of sheer stubbornness. Otherwise, we have no criticism of them. We have no problem. 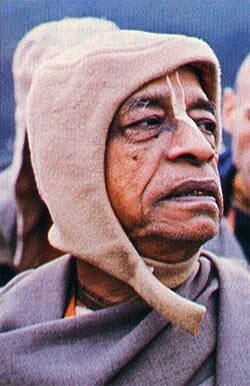 Srila Prabhupada: Why should we be? God is one. Why should we be sectarian? Each person, according to his own particular cultural background and circumstances, is praying to God. That is one of the forms of bhakti, devotional service to God. Disciple: Many of the young people now—they may look to the Bible for instruction, but they stay away from the priests and ministers. They feel they’re hypocritical. Disciple: So then do Christians still need people to give them spiritual guidance? Srila Prabhupada: Surely. Their priests and ministers do not, cannot, guide and uplift them. The priests and ministers are themselves fallen. Otherwise, the Christian religion is very nice—if simply the people have spiritual guides who help them to follow it perfectly. So all over the world, people need spiritual guides who can demonstrate, based on God-conscious scripture, how to love God.